MILWAUKEE, WI. 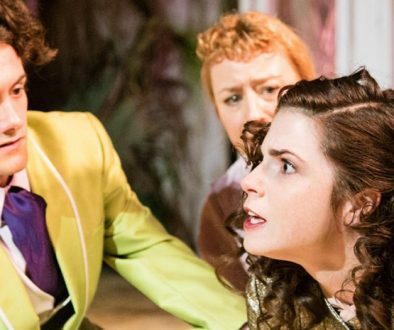 – A small but energetic theater company, Off the Wall Theatre, has produced a memorable production of one of Tennessee Williams’ later works, Small Craft Warnings. This rarely-produced work received lukewarm response when it opened Off-Broadway in 1972. At that time, Williams was 60 and feeling very aware that he was sliding into old age. It was the height of the youth movement, when college students and others were protesting the war in Vietnam. They had survived the 1968 Democratic convention, and started the gay rights movement with the Stonewall riots. Propelled by all these events – and others – Williams wanted to write a play that focused on character more than plot. This device was clearly ahead of its time, which may have resulted in its relatively brief run of about six months. Today’s audiences, raised on episodes of TV’s Seinfeld, etc., are far more in tune with the notion of character-led stories that may not follow a definite plot. If it’s true that Williams was ahead of his time, it’s also true that he was more open about his own sexuality. 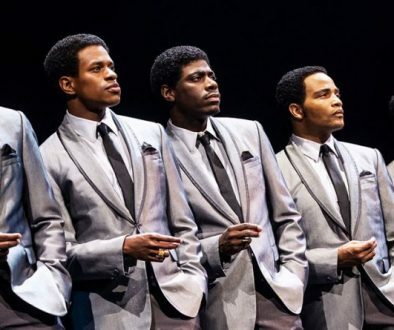 The play is notable in that it includes Williams’ first openly gay character (perhaps a nod to the Stonewall riots). Quentin (sensitively portrayed by James Strange), a well-to-do gay character, demonstrates that he is more like the other characters than they are willing to admit. As he speaks directly to the audience, Quentin spills out his wishes, dreams and dashed illusions. 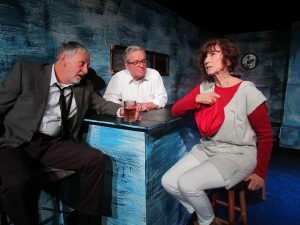 Claiming that he has “lost the capacity of being surprised,” Quentin voices a jaded view of reality that is shared by others who hang out in a seedy waterfront bar called Monk’s Place. Quentin arrives at the bar with a noticeably younger man in tow. Like many of his contemporaries, Bobby (Jake Russell) has been on the move. He rode his bicycle from Iowa all the way to the Pacific Ocean, where he was picked up by Quentin. Although not necessarily gay, Bobby is open to unconventional sexual encounters as part of his personal growth. Eventually, he and Quentin part company. Although Bobby is one of the more minor characters here, Russell’s brief monologue makes him memorable. Getting back to Monk’s bar, which is as broken as the derelicts who come to drown their sorrows. 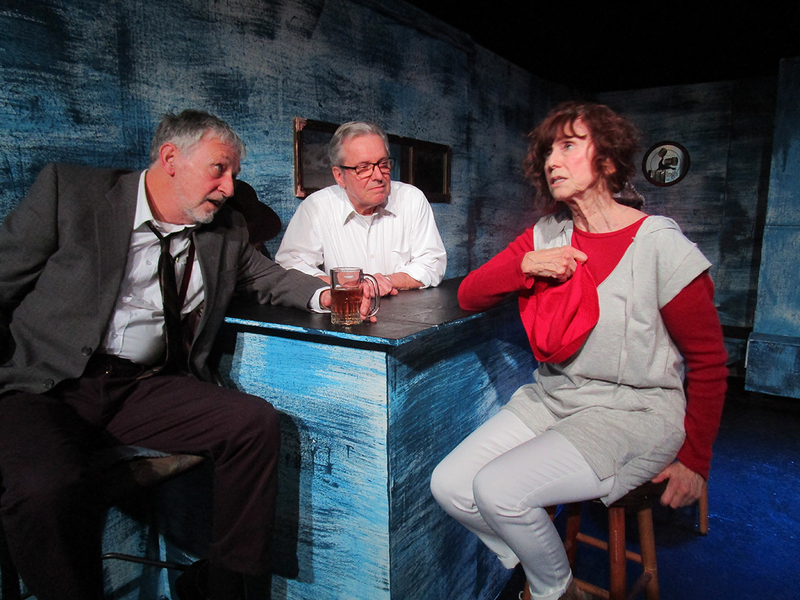 Monk (Robert Hirschi) tells the regulars that a plumber has recently fixed the toilet in the men’s john. However, as Monk is reminded several times, the toilet still fails to work properly. This echoes Monk’s inability to fix the woes of the weary, lost souls who come to his bar to find solace and a willing ear to listen to their problems. In Dale Gutzman’s adept direction, the character of Leona Dawson (Marilyn White) is the centerpiece which keeps the conversation going. She arrives at full steam, yelling about injustice while others try to ignore her. Leona is a middle-aged hair stylist who roams the country in her trailer. She’s also known as a mean drunk who Monk refuses to serve. Leona strides into the bar in full fury. She complains about some of those already sitting at tables and tries to chase them out of the bar. Leona’s fury is particularly directed toward a pair of young down-and-outers who Leona has helped. 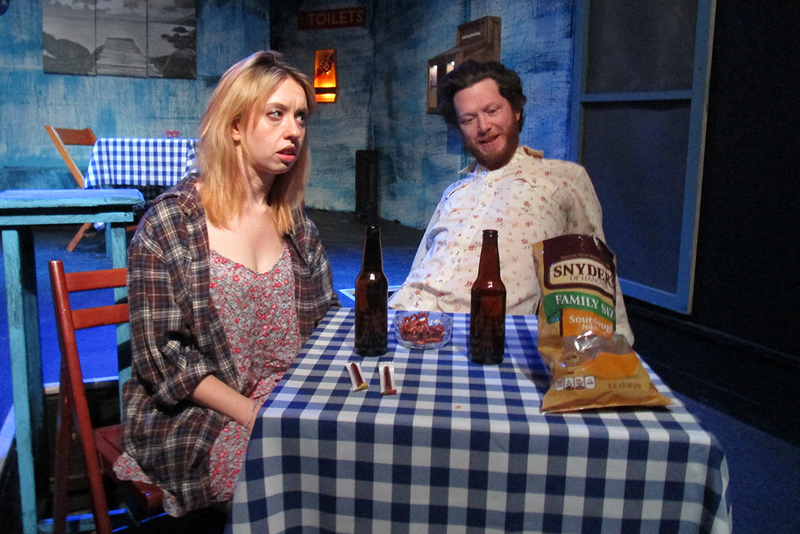 One of these youngsters is a sad Violet (Jenny Kosek), who wears a baggy dress and worn-out slippers. She is carrying a suitcase. Violet lives “temporarily” in a room above a nearby arcade. Like Leona, she travels wherever the wind blows her. She trades sexual favors for her subsistence. Upon entering Monk’s place, she immediately strikes up a conversation with Bill (Max Williamson), a tall, virile young hunk who has been living rent-free in Leona’s trailer for the past six months. Like Violet, he uses his sexual abilities to put a roof over his head. When Leona sees Violet and Bill sitting together, it really sets her off. She slaps Violet, who rushes off to the women’s toiled in tears, and tells Bill that he is no longer welcome at the trailer. Before the play ends, Leona decides that it is time for her to move on. Quentin, Violet and Bill all share the fate of being outcasts in a society that fails to accept them. Leona is also not above using others to get her own way. She offers to pay Quentin to buy a drink for her. While Quentin waffles at the request, Monk hovers nearby to make sure this doesn’t happen. He knows what it takes to keep his bar intact and the police out of the way. Not unlike the “small craft warnings” heard on the bar’s radio as the scene opens, these human “vessels” have gathered in Monk’s Place as a safe haven to weather the storm. All of them are intent on moving on once the fog clears. As the play opens, we meet Doc (Mike Pocaro), another social outcast. 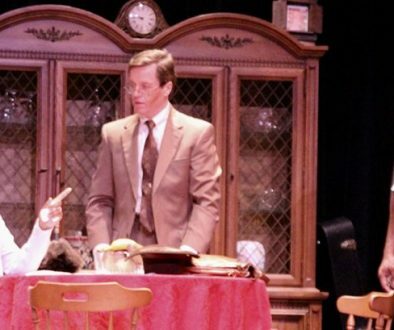 During the play it’s hinted that Doc has lost the right to practice medicine. However, Doc performs the necessary duties (such as births and abortions) to help pay his liquor tab. Mike Pocaro gives us an unsentimental version of Doc, who makes many clear-eyed observations even as he drowns his misery in brandy. His performance would have pleased the late Tennessee Williams, who played the character of Doc near the end of the play’s Off-Broadway run. 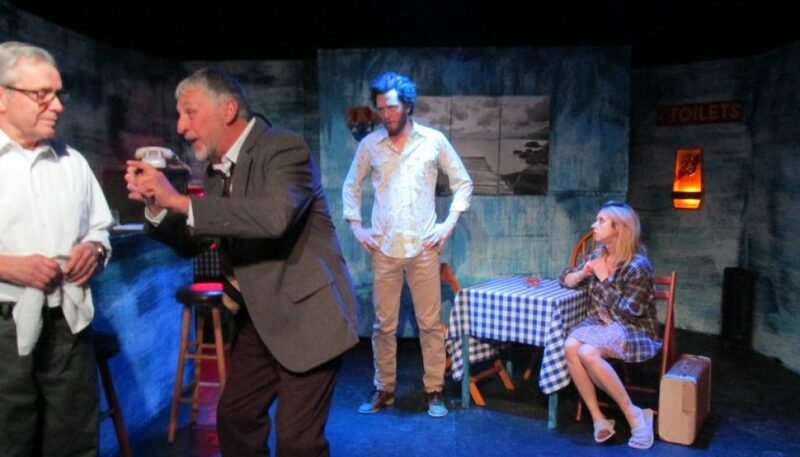 Tennessee Williams’ “Small Craft Warnings” at Off the Wall Theatre. (Photo courtesy of Dale Gutzman. It is entirely fitting that Small Craft Warnings should find a home in this very intimate, black box space of about 50 seats. The nicely constructed set (by Randy White and others) puts the audience nearly in the lap of the proceedings onstage, adding to the production’s realism. The play is peppered with the sounds of a far-off arcade, as well as police sirens and the roar of the surf (credit to sound director Lawrence Lukasavage). Although even Williams considered Small Craft Warnings to be a minor work in his repertoire, there is nothing minor in the Off the Wall show. it is given a masterful, full-out production in the hands of Dale Gutzman and his cast. 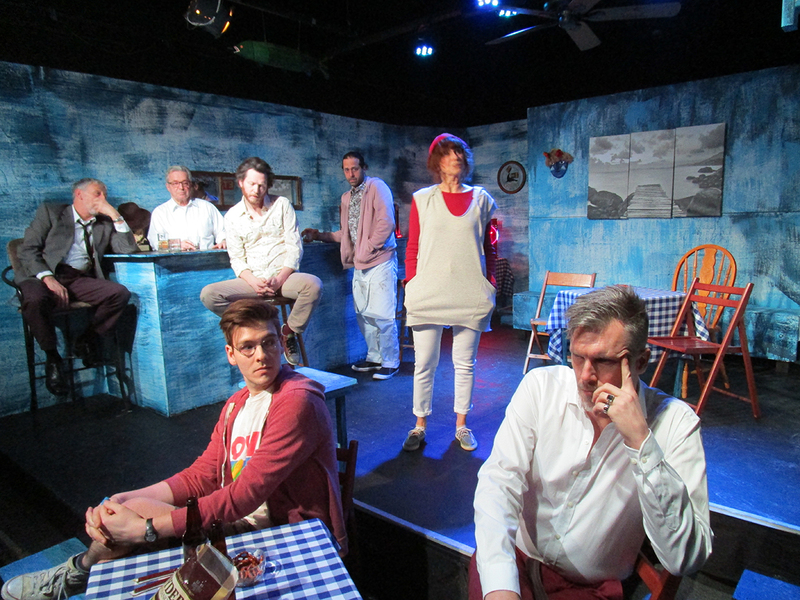 Small Craft Warnings continues through Sun., March 3, at Off the Wall Theatre, 127 E. Wells St., in Milwaukee, WI . Anne Siegel writes about theater from Milwaukee, WI. She is a longtime member of the American Theater Critics Association.